Find out if cyber criminals can penetrate your email filters with our free test. Did you know that email is still the #1 attack vector used by cyber criminals? Spoofed domains, malicious attachments and executables to name a few... With email still the #1 attack vector, do you know if hackers can get through your mail filters? 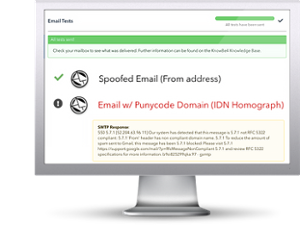 KnowBe4’s NEW Mailserver Security Assessment (MSA) tests your mailserver configuration by sending 40 different types of email message tests that check the effectiveness of your mail filtering rules. MSA gives you a quick insight at how your mailserver handles test messages that contain a variety of different message types including email with attachments that contain password-protected, macro zipped, and .exe files or have spoofed domains. Saves you time! No more manual testing of individual email messages with MSA's automated send, test and results status. Results in an hour or less! Find out now if your mailserver is configured correctly, many are not! NOTE: We need a valid email address from the domain of your own organisation, so Gmail, AOL, Yahoo or any other ISP are not accepted.